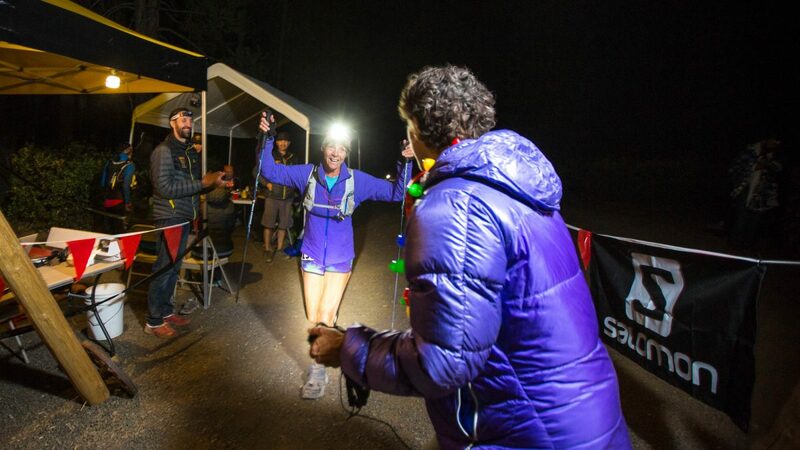 Castle Peak 100k is one week out! We trust that you are well prepared in body in spirit, and your all-volunteer race team is busy preparing as well. As you know, this is not a race that you can “just show up for.” There will be another email update on Monday night that will include the final runner manual. In the meanwhile, please review these updates. Parking: We recommend that you park at the finish and enjoy the free shuttle (from the Truckee Donner Lodge) to the start. Your car will be waiting for you at the end of a long day. You will be able to drop a “finish line” bag at the start. Listen to our parking volunteers. Park at an angle so we can get as many cars on the paved road as possible, and do not block any roads. Do not park beyond where the pavement ends on Cold Stream Rd. Driving Directions: There is some road construction that will impact your crew’s access to aid stations. These will be detailed in the runner’s manual next week. Finish Line Food: We will have free dinner and celebration for all runners and volunteers. Friends and family, please bring $5 to help offset costs. Volunteers: We could still use help, especially for the later shifts. If your friends and family can help, have them sign up by clicking here. Cut-offs and dropping: Castle Pass aid station cut-off has been removed, but 7pm is still the cut off to continue beyond Van Norden. If you must drop, you may do so at Johnson Canyon or Van Norden. You could drop at Castle Pass, but you may be sitting there for several hours before you get shuttled out. No drop zones include: Andromeda, Summit Lake, Devils Oven, Hole in the Ground, Crows Nest, Mt. Lincoln, Coldstream. Once you leave Van Norden you have no bail out point. Aid Station details are available on our website – click here (also find a GREAT printable chart for your crew). Bib pickup, check-in, drop bags: Bib and swag pickup will be available on Friday, August 25, 2pm – 6pm, at Tahoe Mountain Sports in Truckee. (Come shop: you’ll get 10% off any single non-sale item over $50!) You may pick up your bib on race morning if you really need to. Regardless, EVERYONE MUST DO A QUICK CHECK-IN at the start. No exceptions. For your safety, we must know who is on course. You may bring your drop bags to bib check-in or to the start. We recommend a finish bag so that you don’t have to leave the celebration at the finish area to get your dry clothes from the car. THANK YOU: Salomon, our presenting sponsor, will be on-hand at the finish to show off their latest goodies. We also want to thank Sugar Bowl Resort, Truckee Tourism Business Improvement District, and all of our land partners for their generous support. On-course nutrition: We are pleased to provide our favorite trail nutrition at EVERY aid station: Tailwind Endurance Fuel (mandarin orange) and GU Energy Gels (various flavors). Your swag bag will also feature the newest product from Trail Butter (available locally at Alpenglow Sports in Tahoe City): single serve packets of Maple & Sea Salt Nut Butter. Huge thanks to each of these companies for donating their great products! P.S. Helen’s daughter will be offering Sharpie calf art at Friday bib pick-up with donations accepted on behalf of our land partner, the Truckee Donner Land Trust. Start to Moondance: Very dusty on the upper section of the Animal. Trail is loose and silty. If that bothers you make sure to have a change of socks at Johnson Canyon as your shoes will be filled with a fine silt. Andromeda to Johnson Canyon: Fireroad and trail to are both in really good shape. Johnson Canyon to Summit Lake: Also in great shape. Enjoy. Summit Lake to Devil’s Oven: The initial climb has a few trees down that you will have to navigate around, there are plenty of flowing creeks. some patches of snow and some soggy, marshy areas that are impossible to avoid. Stay on trail and avoid damaging the permitter of the trail. Make sure to turn left towards Devil’s Oven and DO NOT go down to Warren lake. That will be the hardest longest wrong turn you’ve ever made if you go down. After that you will have some snow and sections where the trail is the creek. Again avoid going off trail to preserve the delicate plants. Your feet will get wet. Devils Oven to Castle Pass: Beautiful ridge running with great trail conditions. Note: the downhill from Castle Peak to the pass is very steep. Be cautious. The gravel and rocks are loose and it’s easy to fall. Van Norden to Crows Nest: This is beautiful trail running in Royal Gorge. Crow’s Nest to Mt. Lincoln aka The Palisades at Sugar Bowl: The route is barely a goat trail this year. The harsh winter caused lots of erosion and no trail work has been done. That being said, there will be a flag every 10 meters or so for the entire stretch and for those running at night there will be LED lights on many of those flags as well. Mt Lincoln to Coldstream: Lots of downed trees on upper coldstream trail. Pay attention when going around them. Once you hit the fire road the route is in good shape except for the fact that winter has washed out a lot of the dirt so you’re basically running on rocks the whole way down. Coldstream to the Finish: Again, more rocky roads and then a dusty fire road to the finish. This year the last 1/2 mile will be on a paralleling single track vs. the rocky fire road. It is a nicer run. Can’t wait to see you all finish! Photo by Scott Rokis.